Two major concept of the Renaissance were individualism and secularism, but a new movement, humanism, made its way to light in the Renaissance and was one of the defining characteristics of the scholars and intellectual movement during that era. The goal of Humanism is simply to reincorporate the works and culture of the ancient Greek and Roman societies and so the Renaissance Humanists studied what we now call the humanities which includes grammar, rhetoric, poetry, ethics and history all of which were based off of ancient Greco-Roman authors and works. Most of the Renaissance Humanists eventually got jobs as teachers or as chancelleries, but very rarely as a member of the clergy. A man named Petrarch is known as the best when it came to promoting Humanism in the Renaissance. He lived from 1304 to 1374 and did many things such as search libraries across Europe for forgotten ancient texts and promoted the belief that the Medieval world knew nothing of the classical literature or culture. He was also able to make Cicero and Virgil the models of prose and poetry for Humanists. While the normal Humanist was likely employed as a teacher or as a chancellery the Humanists of Florence in the 1400's brought Humanism into a new light. The created Civic Humanism. Civic Humanism is the idea that the life of an intellectual isn't one of solitude, but one in which he benefits his state. Cicero, an intellectual as well as a orator and statesman, was the model of Civic Humanism. One man Leonardo Bruni (1370-1444) wrote a book called The New Cicero which was praising Cicero's participation in both the intellectual side of life and in the political and state side of it as well. Civic Humanism quickly caught on and it soon became an intellectual's or Humanist's job to benefit his state. Leonardo Bruni was also one of the leaders in promoting the scholars of the anent Greek world which seemed to be a more common and popular interest during the Renaissance. The scholars of the ancient Greek society had previously been ignored because they were viewed as irrelevant to answering any theological quandaries of the Middle Ages. As time went on men such as Lorenzo Valla (1407-1457) were working to specify Humanism and make pick out times during which ancient Greco-Roman societies existed. The late 1400's saw the emergence of an interest in the works of Plato and a philosophy known as Neoplatonism. The interest in him and his works was mainly evident in Florence among a discussion group known as the Florentine Platonic Academy. The academy was headed up by one Cosimo de' Medici and the society had a man named Marsilio Ficino, also a member of the Academy, translate all of Plato's dialogues. Afterwards he combined Christianity and Platonism to create a new philosophy he called Neoplatonism. Neoplatonism was based on two major concepts: one that there was a hierarchy of substances and two that there was a underlying spiritual love (Spielvogel). The hierarchy consisted of plants at the bottom, man in the middle and God at the top as the purist substance in the universe. Ficino believed that the true end of life was achieving the full bond with God and that until then we are merely a link between this world because of our body and Heaven because of our soul. The second part of Neoplatonism, that is that there is an underlying spiritual love in everything meant that all things are bound together by sympathetic love just as humans are (Spielvogel). Cosimo de' Medici didn't stop at integrating and stressing Neoplatonism, but also cultivated Hermeticism. He did so by again having Ficino translate a book titled Corpus Hermeticum. This book contained ideas about the occult sciences such as astrology, alchemy and magic as well as theological ideas such as pantheism. The ideas that Hermeticism brought with it encouraged the creation of a new theological concept. This new concept viewed humans as spiritual beings who had chosen the material world. Though they were no longer divinity they could regain their power through the purification of their soul and after words possessed truth of God and of nature and could use the power of nature for beneficial purposes. 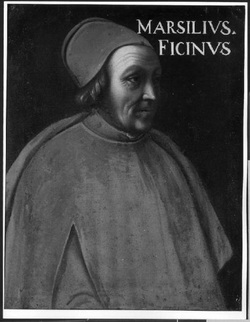 Two of the leaders of Hermeticism were in fact Ficino and his good friend Giovanni Pico della Mirandola. Pico is mostly famous for a book he wrote called The Oration on the Dignity of Man. In his book the major concept he pushes is that man can accomplish anything that he sets his mind to.